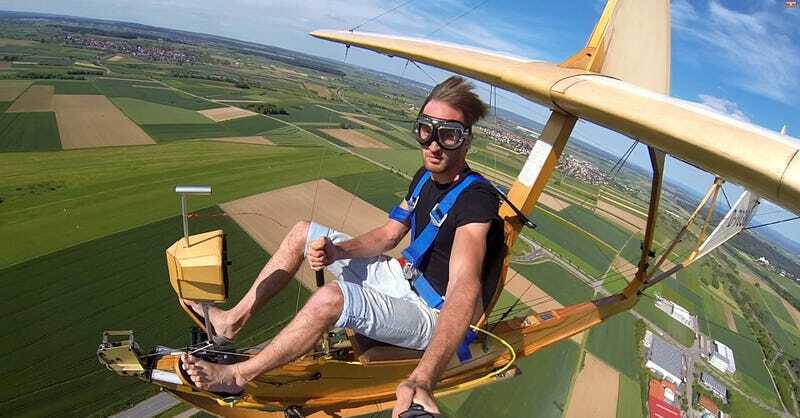 This dude is flying a Schulgleiter SG38 over Baden-Württemberg, in Germany, an extremely rare glider built in 1938 for the National Socialist Flyers Corps, a paramilitary organization of the Nazi Party. 10,000 of them were made, and many of the pilots who learn to fly on it became Luftwaffe pilots. In fact, according to the Wikipedia, "when Nazi Germany formed the Luftwaffe, many NSFK members transferred. As all such prior NSFK members were also Nazi Party members; this gave the new Luftwaffe a strong Nazi ideological base in contrast to the other branches of the German military, who were composed of "Old Guard" officers from the German aristocracy."